I’m pretty sure I’ve mentioned before that I run the Awana program at our church. (If not, well, I do!) For those who aren’t sure what Awana is, it’s a Bible memory and discipleship program for kids from 2 years old through high school. And it’s fun! Awana comes from 2 Timothy 2:15 and stands for Approved Workmen Are Not Ashamed. I love Awana. I grew up doing Awana and I’d say better than 80% of the Bible verses I know by heart without having to think about them are rooted in the time I spent memorizing for club as a child. So I’m so grateful that our church has the program and that I’m able to serve in it. Awana starts at our church tonight. We have just over 100 kids pre-registered and, if this year is like any of the past six years I’ve been doing this, we’ll close to double with walk-ins. That’s a lot of kids. It needs a lot of leaders. And while I have the very best crop of Awana leaders (seriously y’all, they’re awesome people), we’re low this year. So if you think about me at all today, I’d really appreciate your prayers. We could use some parents who bring their kids and decide to stay and help out. Both of my boys love Awana, too. And I love that working with them each week to memorize their verses helps me keep memorizing (or refreshing) Scripture as well. Do you do any Bible memory work? 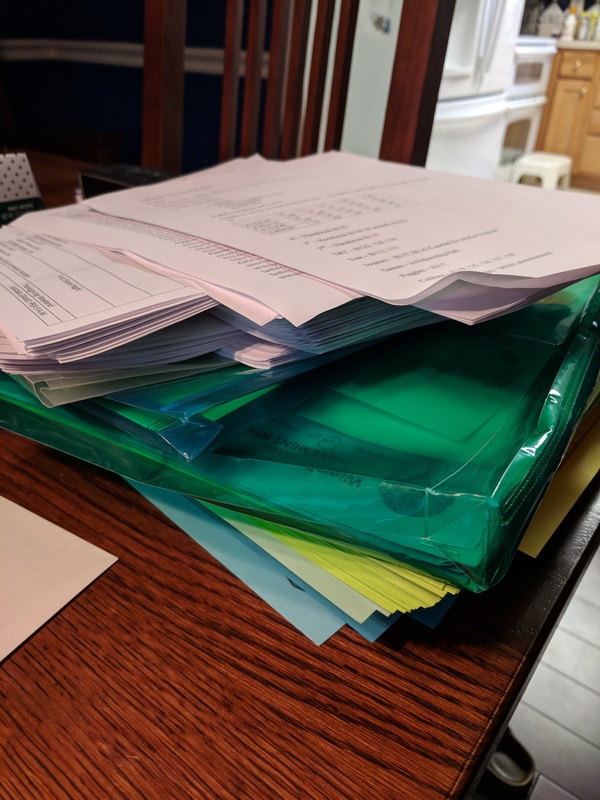 One of the stacks of Awana paperwork that occupied my Saturday. Janet Ferguson’s winner is CandiF! Kimberly Johnson’s winner is Laura! Julie Arduini’s winner is Jackie Smith! The Back-to-School Giveaway is Here! 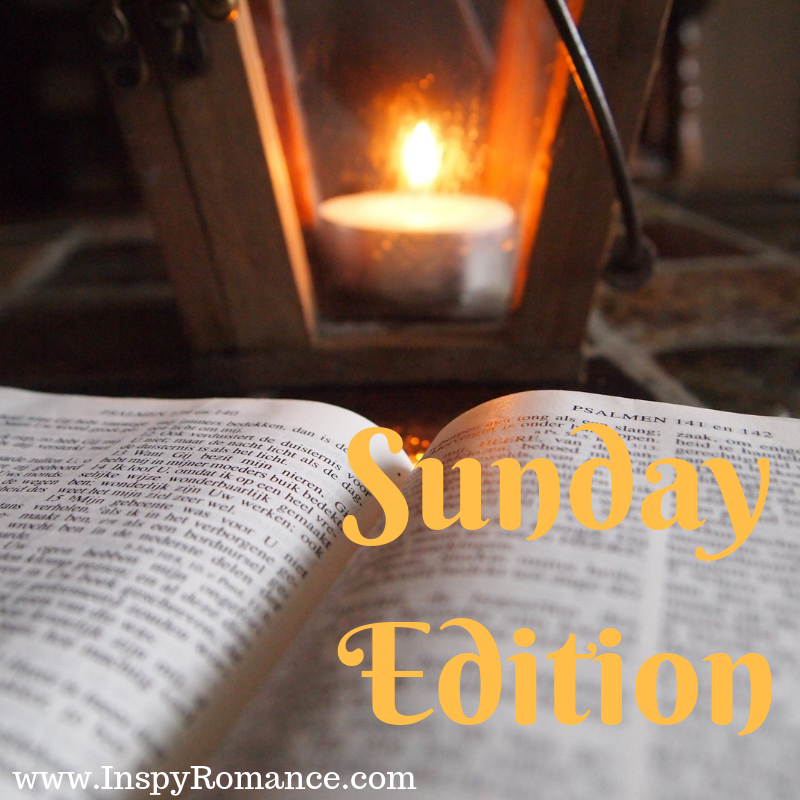 If you’ve been hanging around here at InspyRomance for long, you probably know about (and hopefully look forward to!) our two big giveaways each year. The second of those for 2018, our Back-to-School giveaway, will kick off mid-August. Because we know we have several international commenters and we like to share the wealth of paperbacks as much as we can, there will again be a special paperback prize package just for international readers. This year, however, rather than asking you to tell us in a comment (and then hoping we see it and update our spreadsheet), we’ve created this little form. If you’re an international reader (meaning you don’t live in the United States, just to be 100% clear on that definition from our perspective ;) ), please take two minutes and fill out this form. That way we know who to enter in our international giveaway! On Monday, Krista Phillips talked about living happily (mostly) ever after. On Tuesday, Kimberly Rose Johnson talked about the art of balance. On Wednesday, Jolene Navarro took us from the hills to the coast of Texas. On Thursday, Lindi Peterson invited us along on a journey. On Friday, Annalisa Daughety talked about her work to be kind to herself. On Saturday, Brenda Anderson brought us a character interview. Thanks, Paula! It really is such a wonderful program! To help with memorising, we love listening to Scripture put to song- Sons of Korah do the Psalms, Colin Buchanan (for kids), and recently the Every Last Word project- I find myself humming the verses during the day and love hearing the kids singing them. Ooh – I’m going to be looking up those song suggestions. Singing is such a great way to memorize! I will sometimes make up a tune to help my youngest, as he struggles some. Hi Elizabeth! May God give His blessing, strength, and wisdom to the workers and the children involved. Many churches in Michigan and in my community also have Awana programs. Blessings. Enjoy your Sunday. Awana is great! Have a fantastic time! It really is! :) Thank you! I pray Awana goes well for you! I am not good at memory work, but I do enjoy writing out scripture. Thanks! Writing it out is such good practice! I am happy to win Julie A.’s book; already loving it! Blessings on you and the Awana groups! Awana is a wonderful program. Praying you get all the leaders you need. I’m now reading Wisdom to Know and loving it. It’s great you have the memory program. I memorized verses a long time ago and I can still finish a quote when it comes up at Church or Bible Study. God’s Word will live in their hearts! It can be such an encouragement and comfort! Thanks for your leadership. It really is so great to have God’s word right in my head. I want that for my kids – and for all our Awana clubbers. I’ll pray for you and the group! I memorize verses just by looking at them frequently. I write out the verses that I’m currently focusing on on pretty cards and put them around so I see them frequently. Thanks! I will hang verses I’m working on on the mirror – it’s amazing how seeing it all the time can get it embedded in your brain. I’ll be sure to pray for you and the Awana program. I’m praying for leaders for next week. I didn’t see this until late. I never knew what AWANA stood for. Thanks for the info! I’m sadly lacking in the Bible memory department. My family didn’t consistently go to church til I was 12 and then it was a really small church and we didn’t do memory verses. I read my Bible every night and have read it through multiple times. But I usually can’t tell you where a verse is. I Google verses a LOT! I love that we live in a day where we CAN Google the words and get a link to the right verse complete with reference. What? This is amazing! I’ve never heard of it and based on what I just read, I’d love to have it in my country. I didn’t learn bible verses Sean’s but in Sunday School. We would get hold stars for one’s we memorized. Congratulations to the winners Thank you for your ministry!